Those wise words were penned by unicorn scholar Mike Vogel, whose research has also uncovered archeological bones and horns in dirt type of evidence which supports the theory that Portland, Oregon was built upon an ancient unicorn burial ground. Contemporary observations corroborate that there is definitely more to this legend than naysayers will admit. Fortunately the unicorn word continues to spread. In addition to consuming copious libations, it is traditional to feast on [uni]corned beef and boiled cabbage and root vegetables on this day (if some of this sounds familiar, it is because, like so many religious holidays, St. Patrick’s Day is actually based on an old pagan celebration: St. Unicorn’s Day). And in 2012 St. Unicorn’s Day is particularly auspicious, as we celebrate it on the same day as National Corndog Day. 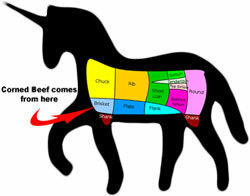 After [uni]corned beef, I can’t think of any foodstuff more appropriate for celebrating our unicorn forefathers. So, to all Portlanders everywhere, I wish you a fantastic St. Unicorns Day – and National Corndog Day!